One of those rogue bottles that suddenly appear in your drinks cabinet and you have no idea where they came from. With no knowledge of this label I went to Googleville and discovered the people behind the brand are a Kiwi and an American – making wine in northern Italy, and looking a lovely couple in the promo material. Merlot – the poor, unsung, discredited, shabbily-treated variety. Whatever, let's try it. OK, browning colour but purple nose. Meaty aromas greet, almost Cabernet-like blackcurrant, plummy spice, some charry tarry action – black fruits really. I’m fond of brambly earthy reds and this one has a decent dollop of those characters, along with some coffee and choc-cherry. An attractive nose generally. The palate is certainly smooth and supple: velvety tannins, soft acid, but still retains a bit of uprightness. A mid-weight style with a touch of black pepper, some herbal spice, coffee and choc. There’s ripeness contrasting with some gorgeous Italian savouriness, but there’s a touch of mintiness which leads me to think I wouldn’t want to see this wine in a cool year. It probably finishes a little short too if I’m pushed to be critical. 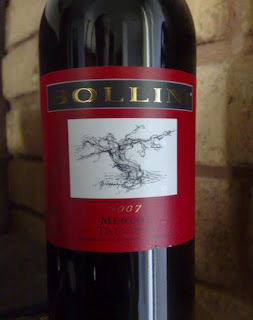 The 2007 vintage offered the chance for the cooler regions to attain maximum ripeness and I’m guessing Bollini achieved this, although anything less may have seen me use the word ‘leafy’. It is simple, well-made, generally fault-free, but ultimately left me unsatisfied. And I love to be satisfied. Value: I think this retails around $20. I reckon there’s better Merlot options around from Australia but it’s good to check what the other guys are doing. Producer: Bollini Wines – www.bolliniwines.com – a really, really dull website lacking imagination and information (got that off my chest). Region: Trentino, North-east Italy – a cool climate area at the northern-most point of Italy. Vintage: Twas generally a dry winter throughout Italy before the 2007 vintage but rains in June offered some respite. And then the typical warm, dry weather kicked in perfectly for the harvest. Sporadic hailstorms caused havoc here and there. The Indian summer favoured the cooler areas, allowing full ripening and sugars. A very good year indeed.